Grabagun gives you great value for your money! The Ruger SR40 is an excellent handgun. GrabAGun had it for an excellent price. 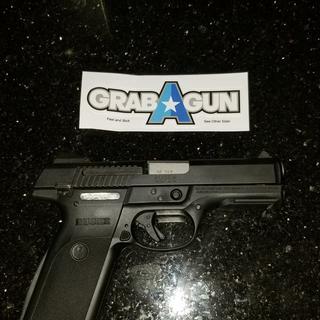 Grabagun is now my first thought when my friends mention purchasing firearms. I like my Ruger SR40 enough to buy the compact as well. You guys are great, I received my Ruger so fast. I'm on your website each day, trying to decide what I want to order next! By far one of the best .40 cal. pistol that I have shot. The action and grip is unmatched in its price range. I highly recommend this pistol to anyone who wants something dependable and great to shoot. Even the magazine was so smooth. I really cannot find any problems with this one. I "test fitted" countless handguns in my price range, and a few above it, and the Ruger SR-Series is, to me, by far the most comfortable in terms of grip. I went to a few different gun shops and asked the clerks what the best .40 caliber handgun would be within the price of the SR40 and they all said that was probably the best choice. I only fired 50 through it so far, during my concealed carry class, and it performed admirably. Very accurate and consistent, even when I didn't have perfect sight picture. The slide release, safety, and magazine release are all in perfect locations and allow for quick magazine changes without taking the barrel off the target. The slide automatically releases when a full magazine is inserted. My ONLY complaint with this handgun is the breakdown pin. It's petty, but I'm used to having a breakdown lever. Overall, the Ruger SR-Series of handguns are fantastic. I'm thinking about going with a 9c or 40c for a second, smaller choice. •Semi-auto, striker-fired •Through-hardened stainless steel slide •Custom slide reduces recoil & slide velocity for comfortable shooting •Black, high performance, glass-filled nylon grip frame •Ambidextrous manual safety & mag release •Adjustable high-visibilty 3-Dot sight system •Mounting rail •Includes (2) flush-fit magazines, magazine loader & hard plastic case •Width: 1.27" •Ht. : 5.52" Length: 7.55" •1:16 RH twist •Wt. 27.25 oz.